Lumineers are a painless way to bring out your whitest, healthiest, and most beautiful smile. Lumineers are ultra-thin shells that can cover up dental imperfections, and they can be placed without any drilling or sensitivity. Reshape Unsatisfactory Teeth: Do you have a tooth that is too small or misshapen? Don’t let those minor problems ruin your smile. Lumineers will reshape the tooth to give it a full and even look. Rebuild Chipped Teeth: If you have a chip on one or more of your teeth, you can fix up your smile with Lumineers. Lumineers will enhance your appearance and protect the tooth from decay and further trauma. Permanently Whiten: Lumineers are the ideal whitening tool for dull, stained, or discolored teeth. Your new teeth can be stunningly white, and they will be resistant to staining over time. Close Gaps Between Teeth: Is an unsightly space between your teeth affecting your smile? Lumineers are a non-invasive way to close those gaps and create well-shaped teeth. Straighten your Smile: That’s right, Lumineers can even make minor alignment changes to your smile. Many adults can skip the braces when they use this form of instant orthodontics. And More: If you want to change your smile, chances are, you can do it with the stress-free Lumineers procedure. Come talk with our qualified dentists to learn more. What’s the Difference Between Traditional Veneers and Lumineers? Traditional veneers require the removal of natural tooth. Before your dentist can place veneers, he or she will have to remove healthy tooth structure. Lumineers eliminate the need for shots, drilling, and natural tooth destruction. You can preserve 100% of your natural smile when you choose Lumineers. They are even thinner than traditional veneers. Lumineers are also reversible, so you don’t have to put your real smile at risk. Lumineers can even last for 20 years or longer, so you are guaranteed decades of a movie star smile with no pain and no sacrifice! You deserve a smile that makes you feel amazing. We can help you achieve your most confident look with Lumineers, but first you need a consultation. 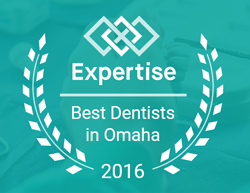 Schedule your friendly meeting with one of our dentists by calling our office today at 402-431-8844.